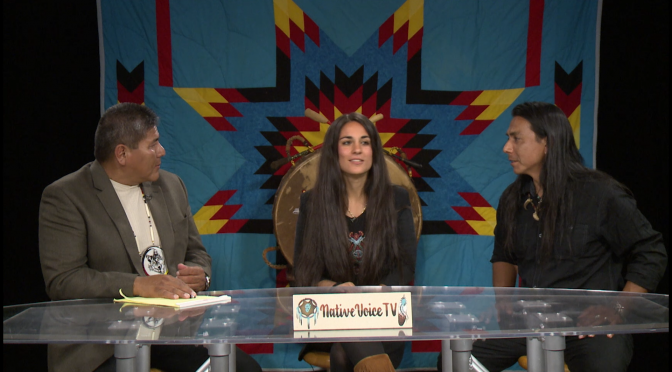 Craig Pasqua (Host) interviews Goodshield and Kat Aguilar on Native Voice TV. Pasqua mentions about Aguilar’s music performance and Goodshield’s involvment in the ‘Buffalo Field Campaign‘ (for over 17 years) http://www.buffalofieldcampaign.org . Goodshield mentions that in Europe there were millions of Buffalo and by the 1920’s there were only 12 left and the Buffalo were the first to be put on the ‘Endangered Species List’. Kat mentions how he knew of Goodshield before they ever met in person via Native Voice TV. She was in Europe when she saw Goodshield as a guest on Native Voice TV. The show continues with songs from Westerman’s music and as Goodshield completes his album it will be dedicated to Floyd Redcrow Westerman (Died in 2007 of Leukemia). On Native Voice TV show Craig Pasqua (Co-Host) has Good Shield Aguilar (Lakota/Pasqua) as a Guest. 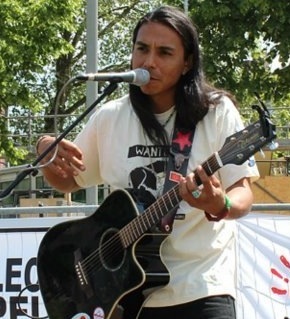 Pasqua introduces Good Shield as Native Voice TV’s writer, singer and performer of its ‘Introduction’ song – “Indigenous Soul”. Good Shield speaks about he was made aware from his aunt (Rosie Little Thunder) about the connection of Lakota tribe to the Buffalo. Since 2002, Good Shield has been involved in ‘Buffalo Field Campaign of Montana (www.BuffaloFieldCampaign.org). He mentions that outside of the Yellowstone National Park 1,000 ‘Genetically Pure’ Buffalo are killed per year. The Buffalo Field Campaign has been trying to pass legislation to make Genetically Pure ‘Buffalo’ as an ‘Endangered’ species (for PROTECTION) and make the Buffalo a National mammal. Good Shield entertains with five songs which two were originals from ‘Floyd Red Crow Westerman and his own three songs. Good Shield ends the show with his contribution song to Native Voice TV – ‘Indigenous Soul’.